Outdoor entertaining has come a long way from a charcoal grill and a picnic table in the backyard. 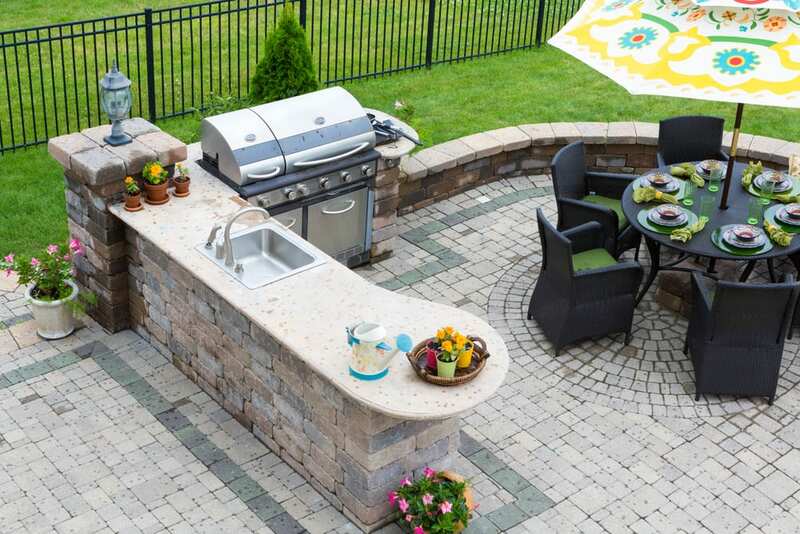 Today, if you can dream it, odds are high that someone can create an outdoor kitchen for you. And if the 33,400 images for “Outdoor kitchens” on Houzz.com are any indication, a lot of people are building these outdoor entertainment spaces (or wanting to). They’re not only fun for entertaining, but they’re also a great long-term investment. According to Realty Times, an outdoor kitchen offers a high ROI in terms of increasing your home’s value—a whopping 80 percent or more. Built-in kitchens—with plumbing and electric—range from U-shape, L-shape, and galley style and typically include a prep zone, cooking zone, plate-and-serve zone, and entertaining zone. Features of these deluxe kitchens, ranging from $3,000-$50,000, include under-grill refrigerators, cabinets for plates and utensils, granite countertops, stone fireplaces, quartz tiles, pizza ovens, pergolas, built-in benches and fire pits, and every kind of seating arrangement you can imagine, from charming café tables to traditional dining tables to lounge-style couches, chairs, and coffee tables. If you’re considering a built-in outdoor kitchen, invite us over! don’t neglect planning ahead for the electrical/wiring needs. For example, you might want to incorporate extensive lighting, you might want outlets above and below the counter for small appliances, or you might need a subpanel for new circuits, buried underground. All outdoor outlets must be GFCI. You’ll want a dedicated circuit for refrigeration as they typically need more amperage. An outdoor kitchen is a great investment, but it needs to be installed properly. If you’re not 100 percent certain of code requirements and compliant wiring specifications, don’t take a chance on doing it yourself—your family’s safety could be at risk. Trust the licensed electricians at Bonfe to take care of proper wiring for your outdoor kitchen, providing you with valuable peace of mind and many, many happy memories of eating al fresco on those beautiful summer days and nights. To schedule an appointment, call 651-273-2122.